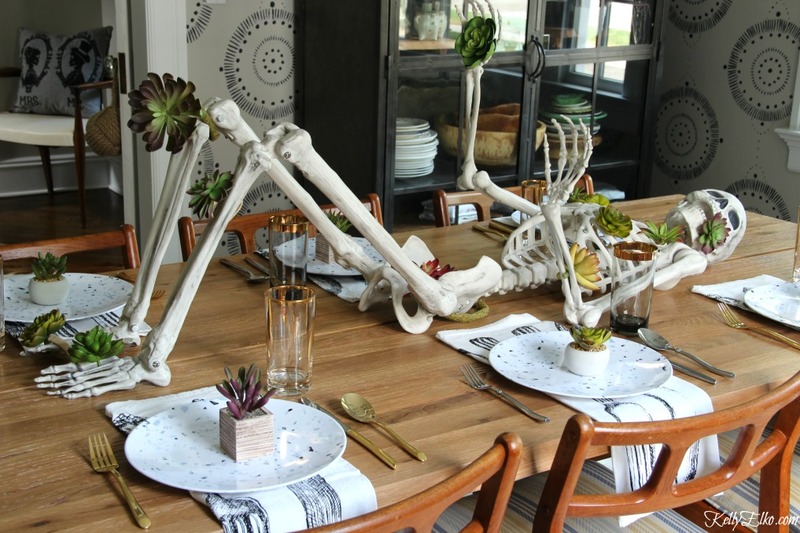 I know my succulent skeleton centerpiece will be the hit of my Halloween dinner party. Meet Mr. Bonypart. I took him to the next level by decking him out in succulents and now he’s ready to impress my guests. 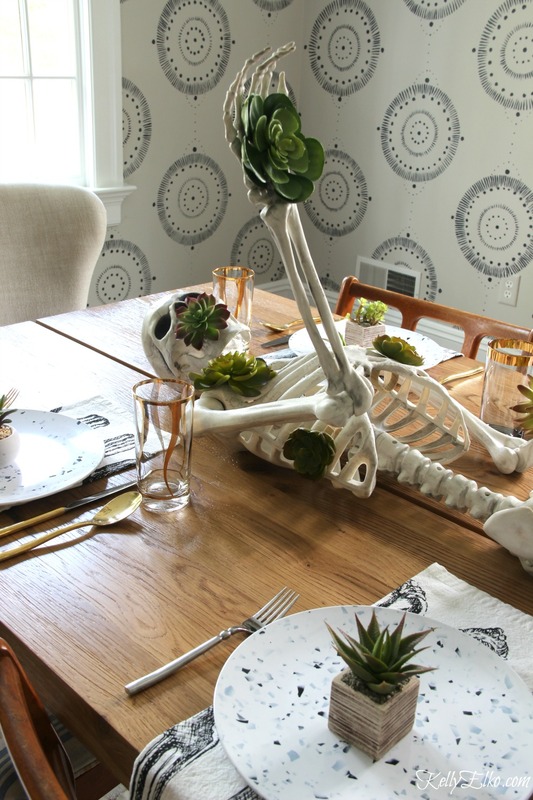 Update: Check out my whole Halloween Home Tour filled with tons of creative decorating ideas here. 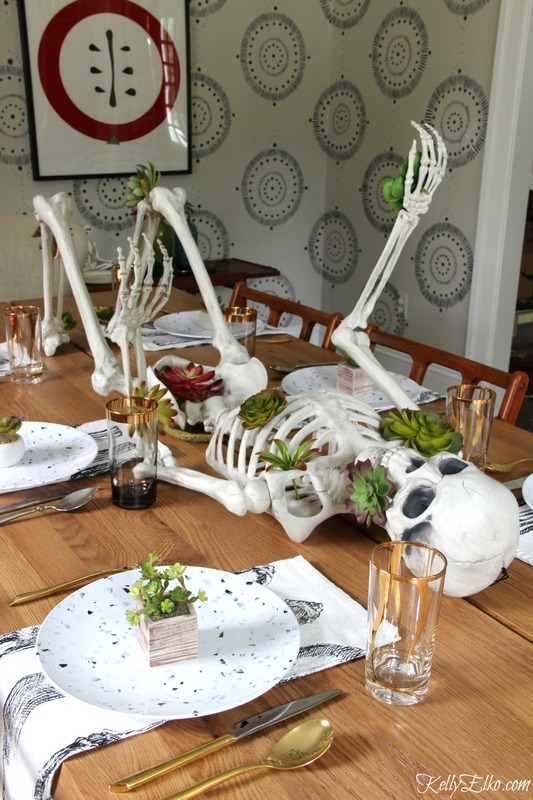 If you love Halloween, make sure to check out all of my Halloween decorating ideas HERE. My girls are freshman in college but not having kids in the house didn’t stop me from having fun with Halloween decorations. I can’t wait to invite my friends over for some ribs and a nice Chianti! P.S. I took these pics before I recovered the dining room chairs – you can see them in all of their fabulous glory HERE. Mr. Bonypart is a life size, posable skeleton! I love that I can put him in all sorts of compromising positions. He takes center stage so the table doesn’t need much else. A simple table setting in black and white with vintage gold glasses and my favorite gold flatware add sparkle. 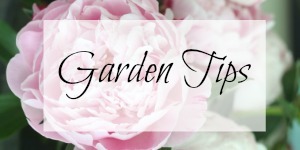 I love these black and white terrazzo plates and at under $2 each, they don’t break the bank. They are melamine but don’t look like it. 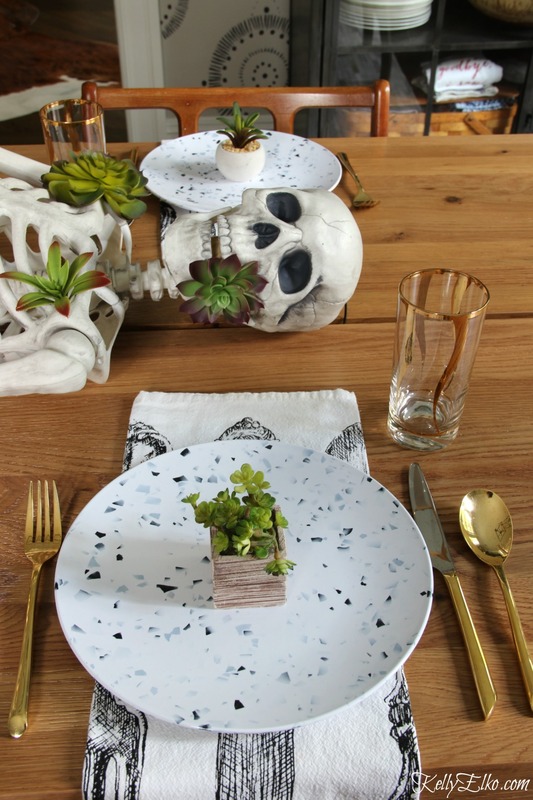 Faux succulents add a whimsical touch. He’s been waiting a long time for a cocktail. Wave bye bye Mr. Bonypart. Come back tomorrow when I’ll be sharing my Halloween home tour (don’t worry, no gore allowed)! 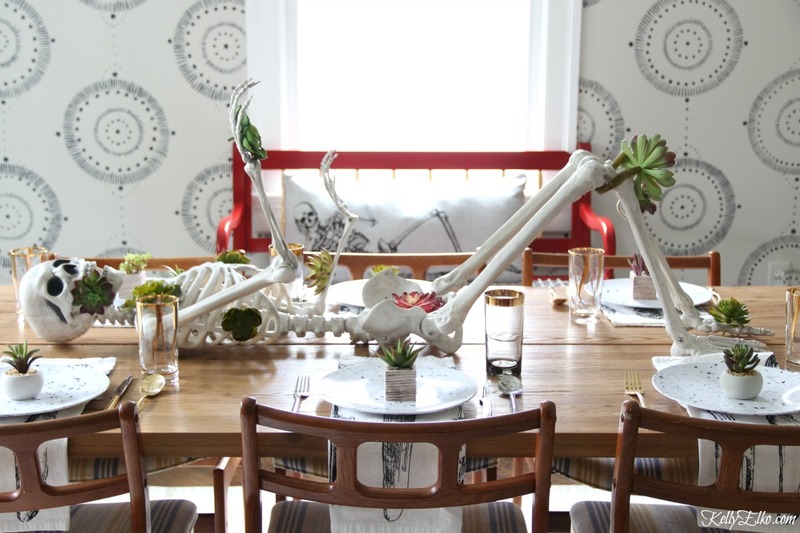 If you dare, see more of my Halloween Decorating Ideas here. Love this so much fun!! 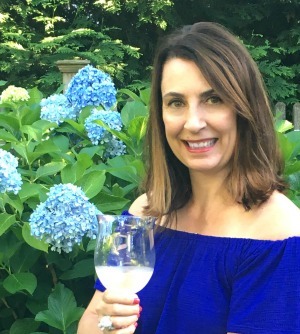 Thank you Hope – it was fun to create! I want to come to your party, this is exceptionally cute, i love it. You amaze me over and over, i love your blog. 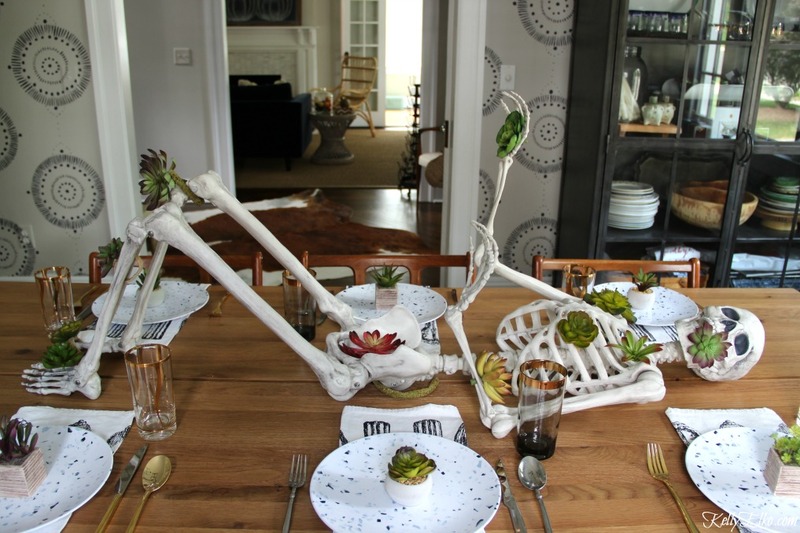 Darling idea for making a Halloween statement. Thanks Marie – everyone that sees it really loves it!